- Mix together strawberries and icing sugar Set aside to ensure sugar dissolves. - In separate bowl, beat whipping cream until soft peaks form. - Then beat in the strawberry mixture. - Add in banana liqueur. - Place in freezer safe container, cover and freeze for 4 hours. (I use an 8 cup Tupperware container with lid). Take out of freezer 10 minutes before serving to soften. Oooh, this looks really cool! 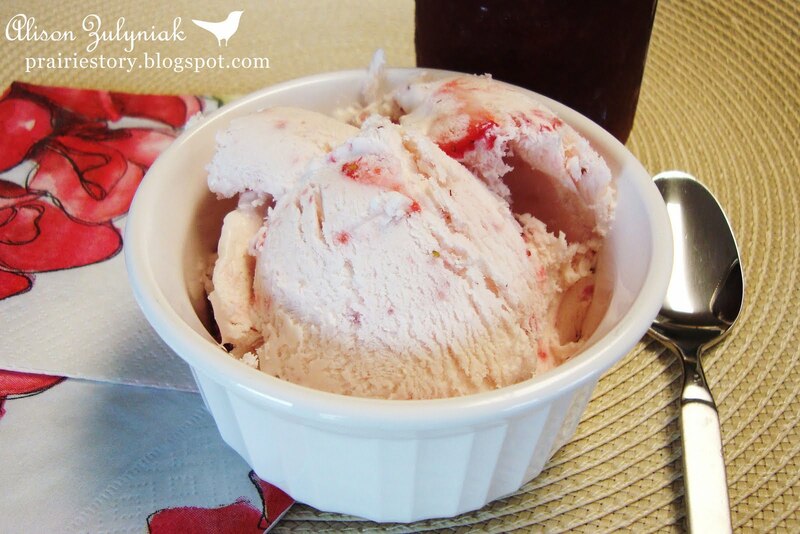 I love this idea for strawberry ice cream--been meaning to make some soon! Yum, sounds delicious! Love the addition of the banana liquor! Following you! Would love a follow back! Sounds perfect--my ice cream maker recently bit the dust! I would never know that this wasn't ice cream from an ice crea maker if you didn't tell me. It looks so perfect! I love strawberry ice cream, and I really like the addition of banana liquor in this recipe. yum... I haven't gotten around to buying an ice cream maker yet. I'm going to try your recipe - it looks and sounds awsome. I don't have an ice cream maker either so this is the perfect recipe for me and it sounds absolutely scrumptious! I don't have an ice cream maker as well, so this is perfect!! Thanks so much for the recipe! I can't believe you made that without an ice cream maker! Your strawberry ice cream looks so good, creamy and delicious! I do love ice cream! I have too many ice cream recipes to make before it cools down! This looks absolutely wonderful. I don't have an ice cream maker so I'm looking forward to making this. Thanks for sharing on T4T this week! Hmm, that looks fantastic. Gonna have to try this method.